Mustonen creates a savage case for an unduly neglected sonata. (...) his super-human agility allows him a freedom unknown to lesser pianists. (...) Mustonen is no less remarkable in Tchaikovsky's Seasons, scorning their gentler, more domestic virtues. A fervently committed rendition of this work, (...) filling the Sonata with this kind of life and sound vitamines, which I have been missing in many other recordings of the piece. Mustonen's fourth solo piano album for Ondine, faithfully rendering his glittering piano sound and technique in SACD quality. 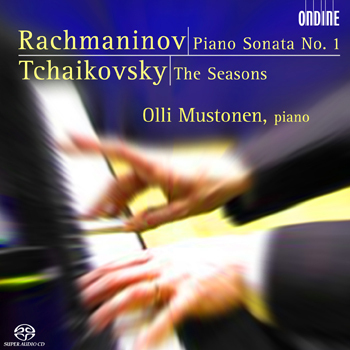 It features Rachmaninov's seldom-performed first Piano Sonata, coupled with Tchaikovsky's The Seasons, a popular cycle of twelve intimate miniatures. Olli Mustonen, praised by The Sunday Times as "a living dream of pianism, having broken through an expressive barrier that other players do not know exists", is known for delivering a fresh and visionary approach to standard repertoire.